Time did not stop for anyone, least of all me, but in that moment of our kiss, I found a little pocket of eternity. 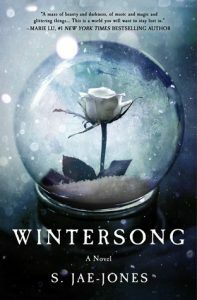 Wintersong is one of those books I worked really hard to get-trying every avenue and applying for every little ARC and giveaway until I got my hands on it. And, while I’m extremely pleased I got it, I can’t help but wish for more. I’ll be honest and say I have no clue what to rate this book. On one hand, I loved the writing, the atmosphere,the absolutely amazing way the author described everything…but, on the other hand, there were moments when I was truly unhappy with the repetitive phrases (Ex: He was once again my austere young man, He wasn’t the austere young man, etc. ), the lack of much plot (near the end), and the rather large focus on music. I understood then what Constanze had meant when those doomed young ladies longed to hold on to him the way they yearned to grasp candle flame or mist. His beauty hurt, but it was the pain that made it beautiful. Yet it was not his strange and cruel beauty that moved me, it was the fact that I knew that face, that hair, that look. He was as familiar to me as the sound of my own music. This was the Goblin King. NOW, hear me out-I don’t mind music in books-AT ALL-but, for quite a while, it felt like all the book had to offer. It based literally everything off their love of music, which is great, but then…not much else followed. For many, this may seem intriguing, and it was beautifully done, that’s for sure, but when the story doesn’t offer much else, I find it tends to bring me down-a lot. In the world above, wishes were will-o-the-wisps: beautiful, but insubstantial and always just out of reach. Here in the Underground, will-o-the-wisps were very much real. Tricksy little creatures: sly, deceitful, but tangible. Touchable. My wishes had weight. That’s not to say I didn’t love parts-The opening was beyond words alluring, beautiful, and had me hooked from the moment I started. I didn’t quite grasp the first 35% per se, finding myself a bit lost at times, but I loved the direction it was going. And I must say, the end was my absolute favorite part of the whole story. 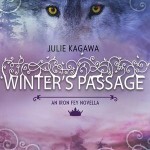 There was romance, there was true love, or what I felt was the truest love of the book-besides sibling love-and a feeling so deep it drew tears to my eyes, even after battling over my true thoughts of this story. An impossible choice. The life of my sister … or the fate of the world. I had thought my stakes were high, but I saw now that the Goblin King’s was even higher. “What will happen to you if I win?” I whispered. A smile crossed his lips, but the corners were downturned, more sad than satisfied. “You know,” he said. “You’re the only one who’s ever asked.” Then he vanished in a swirl of wind and dead leaves. So, as you can see, I’m lost as to what to rate this. Do I go lower because of my pensive thoughts throughout? The pondering over and over again on what exactly to think? Or do I stay higher knowing that, in the end, my heart was content, my mind extremely satisfied, and my curiosity squelched? This was the immortality humans were meant to have: to be remembered by those who loved us long after our bodies had crumbled into dust. This book was heartbreaking. It was beautiful. Dark, sensuous, but sometimes lacking substance and the depth I craved. It could be a bit cold at times, and then all of a sudden lyrical and addicting. I guess all in all…it had everything I ever ask for in a book-It wasn’t too heavy, even for non-fantasy readers, but where it shined in lyrical beauty, it lacked in making me feel for our main character. I don’t think I ever once connected with her like I did Kathe, her sister. She had a brighter personality, something to hold onto. So here I am at the end of it all…and I can only deduce one thing: I both loved and hated this book. I know many people will love this story…I’m just stuck in that horrid in between-still very confused. I know…I was so sad about it, especially because I had worked so hard to get the ARC! I could have focused elsewhere…oh well. Just stinks! I hope you find more enjoyment out of it than I did! I know :/ I both liked and disliked many aspects…I truly struggled when trying to figure out what to rate this. It’s like, so many moments were amazing, and then the rest were blah. How can you possibly say that’s consistent? Bah. I had it as four on GR for a week…but ultimately I had to change it. Idk. Oh well! Raven recently posted…February Most Anicipated Releases! I know…I hate telling people to push it off, but it just definitely isn’t what I’d hoped it would be! I hope many people find enjoyment out of it , though. Aw, too bad about this one! I’ve been looking forward to reading it, too. Your example quotes tell me what I really needed to know about this book- it’s atmospheric, but lacking in depth. Probably not going to grab me the way I was hoping. Thanks so much for the helpful review! Thank you!! I’m glad I can help, although I feel bad it’s so negatively.